My garden had a pretty tough time of it with the cool temperatures this summer (or maybe it’s a lack of skill…had to say). However, despite it all, my zucchini and buttercup squash plants were plentiful! With the below freezing overnight temperatures these last few weeks, it was time for harvest and enjoying some squash! So a quick disclaimer: this super delicious, cheesy, bacony recipe is going to make a whole lot of dishes…but it’s totally worth it! Since it’s roasted ahead of time, the squash doesn’t mush in the casserole. The made ahead cheese sauce pulls all the flavors together. And, well, bacon! Ah well, more delicious pasta bake for Hubs & me! Preheat the oven to 425 degrees F and line 2 baking sheets with silicone baking mats or parchment. In a large bowl, toss the buttercup squash with 1 tablespoon olive oil, rosemary, salt and pepper. Spread evenly on one of the baking mats. Bake for 20 minutes, stirring once. Set aside to cool. In the same bowl, toss the zucchini with the remaining olive oil, salt and pepper. Spread the zucchini on the other baking sheet and bake for 1o minutes, stirring once. Set aside. Meanwhile, cook the pasta according to package instructions. Drain and set aside. Also, cook the bacon in medium saucepan over medium heat until crisp. Set aside on a paper towel lined plate to cool. Add the onions and garlic to the bacon grease and cook for 5 minutes or until tender. Whisk in the flour and cook for 1 minute. Slowly whisk in the milk. Return to a low boil, whisking until thickened. Pour the onion & milk mixture into a large bowl (I used the stock pot I cooked the pasta in, to save a bowl). 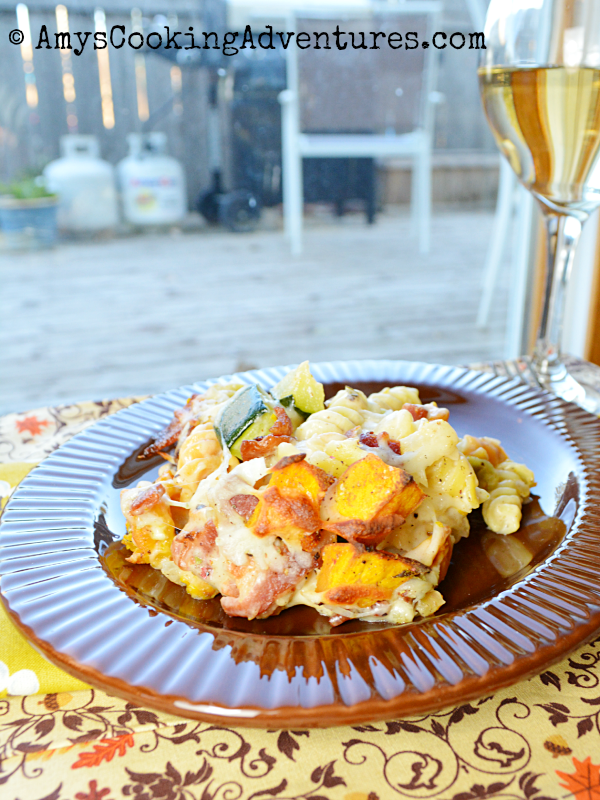 Stir in the cheeses, cooked pasta, zucchini, most of the buttercup squash, and most of the bacon. Pour the mixture into a casserole dish. 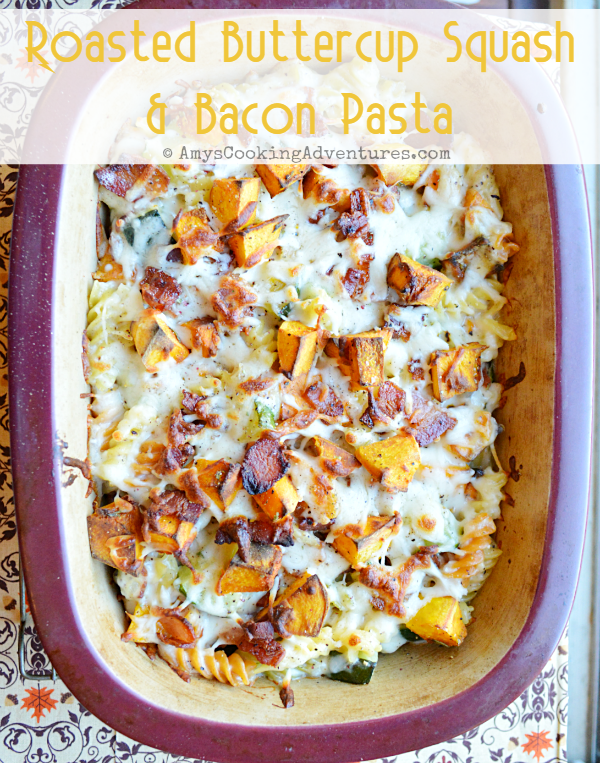 Top with the remaining roasted squash, bacon, and a bit of provolone cheese. Bake in the preheated oven for 10 minutes or until heated through and browned.